Oakland Raiders running back Marshawn Lynch (24) in the final seconds of the game against the Seattle Seahawks during the fourth quarter at Oakland Coliseum. 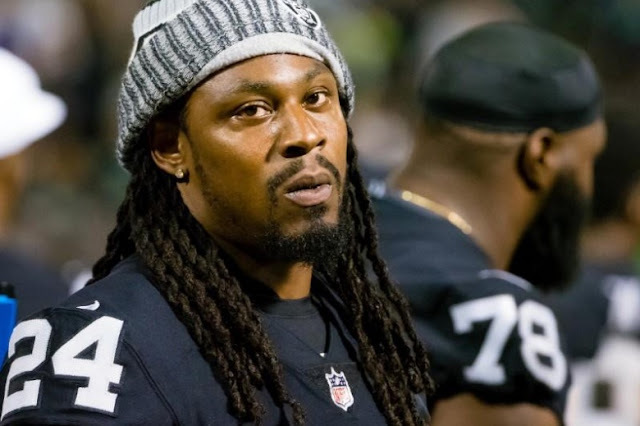 Facebook Inc is paying Time Warner Inc’s Bleacher Report millions of dollars for a reality show on NFL player Marshawn Lynch, the sports site told Reuters - a sign that the social media firm is willing to pay top dollar to lure viewers and ads to its Watch video service. The reality show about the Oakland Raiders running back, called “No Script,” launches at a time when Facebook and other web giants including Amazon.com Inc and Netflix Inc are spending billions on original content in a pitched battle for viewers. Facebook is planning to spend up to $1 billion on original shows, the Wall Street Journal reported. Facebook did not respond to requests for comment on its spending. Facebook’s Watch was rolled out to U.S. users last month. The company has initially been paying for a handful of shows to attract viewers to the platform. It has paid $10,000 to $35,000 for shorter-form shows and up to $250,000 for some longer-scripted shows, sources told Reuters in May. “No Script” will start streaming this month and consists of eight 10- to 15-minute episodes featuring various antics by Lynch, who is returning to football as a running back for the Raiders. Lynch, known as “Beast Mode” for his running prowess, has returned to the league this season after retiring in 2015 from the Seattle Seahawks, where he helped win Super Bowl XLVIII against the Denver Broncos in 2014. The first episode features Lynch taking racecar driving lessons until he ruins the tires of the car. In a deal similar to others, Facebook retains exclusive rights to the show for a period of time, Brown said, declining to elaborate on the exclusivity window. After that period Bleacher Report owns the content and can use it. It was a big priority for Bleacher Report to keep the show authentic, given Lynch’s raw style, Brown said. For the most part Facebook gave Bleacher Report full creative control, however the social media network does have concerns about offensive language, Brown said. “I wouldn’t be shocked if that ends up being censored,” he said.